MISSY ‘THE MISSILE’ VOWS TO BE A GOOD ROLE MODEL FOR YOUNG ATHLETES. I’m not the biggest swimming fan. 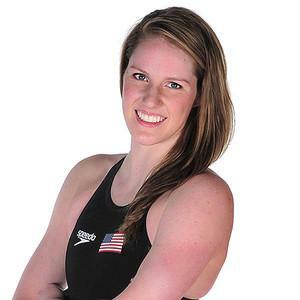 But I’m absolutely stoked that Missy Franklin won Olympic gold today in the 100-meter backstroke. Not just because the 17-year-old high school senior-to-be is one of America’s best and brightest young athletes. But also because Missy “The Missile” is a faithful Christian. And Missy is not alone. There are other noteworthy Americans in London, who, like Missy, have presented their bodies as a living sacrifice, holy and pleasing to God, and who also stand an excellent chance of winning gold (or silver or bronze) over the fortnight of Olympic competition. Then there are other U.S. Olympians, with whom I’ve only recently become acquainted, who have publicly proclaimed members of the body of Christ. From archer Jennifer Nichols to BMX cyclist Arielle Martin, diver Brittany Viola to gymnast Jonathan Horton, and weightlifter Kendrick Farris to wrestler Jared Frayer. I am pulling for each and every athlete running, jumping, swimming, flipping, grappling, scoring or otherwise competing for the USA. But I am rooting especially hard for our red, white and blue Christian athletes. 30 Jul	This entry was published on July 30, 2012 at 2:49 PM. It’s filed under Sports and tagged ATHLETES, CHRISTIAN, MISSY FRANKLIN, OLYMPICS. Bookmark the permalink. Follow any comments here with the RSS feed for this post. Newer: Are Transgenders the New ‘It’ Minority? Other than hunting, fishing and Golf (all three I haven’t done in years) I have little interest in sports. I would enjoy watching the Mets playing the Yankees in a series as I am from N.Y. That is only because they are the home team. With that said, I am also glad and pray for our Christians in the Olympics. May they shine glory not only on themselves or the Country but mostly on the God they adore.